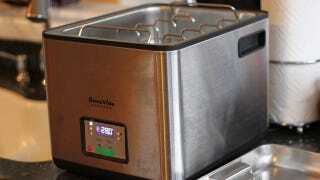 Sous Vide Machines: Amazing or Overrated? With the advent of molecular gastronomy and modernist cooking, sous vide machines have come into vogue. In short, they cook your vacuum-sealed bags of food (meats, vegetables, whatever), in a bath of warm water kept at a constant temperature. The benefit is supposed to be that your food is never overcooked, and always tender. But there are the critics who say the end result isn't thaaaaat amazing (and carries some health hazards if you're not careful). What say you, tech chefs? Is the case for sous vide cooking overstated?